You want... You want this to be the best party ever. Everything has to be perfect, right down to the cups. #glamist Bride & Bride Tribe cups are the best bachelorette cups you can get anywhere. Super stylish and durable, our cups will not leak or spill...unless things get crazy. You need... The finishing touch... Been to a party where everything looked great...except the tableware? Don't mix and match cups and don't use tacky red solo cups or fragile frosted plastic punch cups that always crack. Get the Bride and Bride Tribe 11 piece set and put all other parties to shame. You get... 10 pieces of white and gold 16oz Bride Tribe cups and 1 gold and white 16oz Bride cup. These cups are the perfect way to show off your party skills. Great for all types of drinks and even perfect for games like beer pong and flip cup. Take the party to the next level... We make the prettiest cups you can buy. Whether you are the bride, best friend, sister or mother, you will be the envy of anyone who has ever tried to plan a party. Elegant white/gold cups and gold/white cups tell guests we are here to party, and we might as well look incredible doing it. We also make sure that everything we sell looks great in pictures...since great snapshots are almost as important as the night itself. Instagram friendly and ready to shoot. Add to your cart and sleep easy knowing you nailed it. 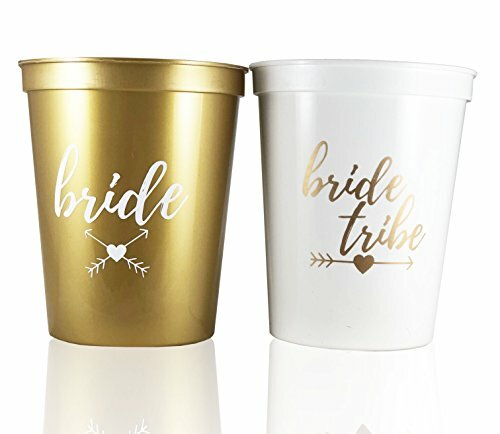 Bride & Bride Tribe Bachelorette Party Cups; Our classy 16oz 11 piece set will get your engagement party started famously; Printed on both sides and unlike cheaper thinner cups #glamist cups are durable and dishwasher safe! SATISFACTION GUARANTEED - When you read the reviews you'll see why our customers "love these", "can't wait to use them", and will definitely "buy again"! If you have any questions about this product by #glamist, contact us by completing and submitting the form below. If you are looking for a specif part number, please include it with your message.